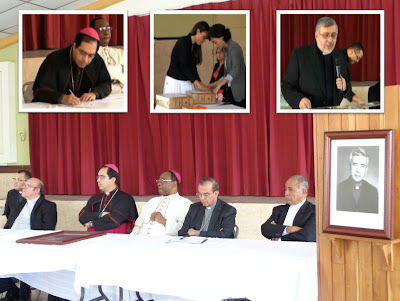 The diocesan phase of the cause of canonization of Father Rutilio Grande, SJ, who is shaping up to become the next Salvadoran martyr to be recognized by the Church as such and raised to the altars, was closed with a formal ceremony at 10 am on Tuesday Aug. 16 in the Archdiocese of San Salvador. Father Grande’s canonization process now goes to Rome, where it will be handled by the Jesuit order. The closing ceremony was held before high ranking members of the Salvadoran Church hierarchy, including San Salvador Archbishop José Luis Escobar Alas, Apostolic Nuncio Leon Kalenga, several bishops and other clergy and members of society, including the Basque-Salvadoran Jesuit theologian Jon Sobrino. At the beginning of the ceremony, Msgr. Rafael Urrutia, the priest who spearheaded the process, said the Church had planned to finish the investigation last November, but the serendipitous discovery of testifying witnesses for the cause in California after the intervention of the now-Bishop of Santiago de Maria, Msgr. William Iraheta, made it necessary to postpone the date of the cause’s conclusion. The ceremony which included the reading aloud of various transmittal letters contained in the documentation that will be sent to Rome highlighted the dramatic effects of the post war period, which have hindered the investigation into the assassination of the priest by powerful interests in the country. Both the designated judge, Fr Hector Figueroa, as well as the promoter of justice, Fr. Efrain Villalobos, asserted that it was difficult to find testifying witnesses amongst the laity of the Aguilares region, where the martyred priest ministered among the unprotected peasants of the largely agricultural sector, because they are still fearful. One of the highlights of the ceremony was the appointment of Rev. Edwin Henriquez as conveyor of the cause to Rome. Henriquez is a diocesan priest who advises the archbishopric in communications issues and has been second vice-postulator of the cause. It will be Henriquez’ job to turn over the documentation to Father Anton Witwer, Postulator General for the Jesuits. During the ceremony, attorney Nancy Beatriz Henriquez, one of the notaries of the process, carefully sealed the packets of documents to be sent. If so, El Salvador may soon have another Blessed.